Even long before technology existed at all, the most common type of food preservation was always dehydrating, due to the fact that everything the method required was only a safe spot to keep the food and watch it dry out. Of course, the method wasn’t totally effective back then, since humidity and temperature were uncontrollable and it was also very likely that pests would manage to find a way to either destroy your food or have a sample of it, or even do both. However, every problem that looked like a mountain in the olden days has now been reduced to a molehill, thanks to technology and the various inventions we now enjoy. Nowadays, the process of dehydrating food has been made easier with the aid of electric dehydrators, due to their appropriate air circulation and accurate temperature controls. Besides, the fact that they are enclosed make it entirely impossible for small pests and marauding bears to steal or damage your food. Instead of reserving food to survive the winter season, people these days do food dehydration for some other reasons. 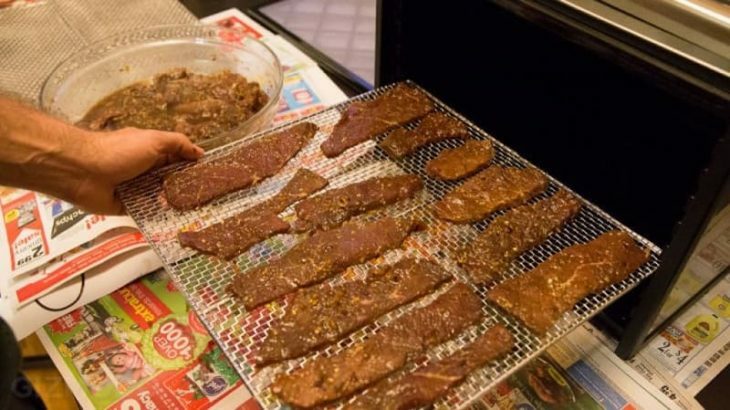 It is a way of saving home-grown herbs, to make fun flavors of jerky, and to explore different combinations of flavors that might be commercially unavailable. 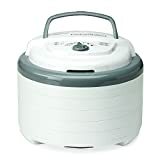 However, despite how great and useful food dehydrators are, buying the right one has been made very complicated with the flood of models and makes in the market. Do you want to know how to buy the right model for your needs? This article will serve as your guide if you read it to the end. You will be guided through every process, and everything you need to know about food dehydrator reviews, from their functions to how they can be used, will be discussed in this article. Besides, we will also review our top 10 picks for the best food dehydrators on the market, so you are advised to sit tight and enjoy! Food dehydration is a practice that has been existing for a quite a long time. In the olden days, people would lay food on a flat rock, under the hot sun so it would dry out. This method was used by Native Americans to preserve fruits, vegetables, and organic products after gathering. But after some time, they improved their methods and they started to hang food from racks built with wood. This way, the food would get to dry after directly hanging in the sunlight thoroughly. Then, they could store the food for extended periods without the fear of it getting spoilt. Back in those days, the fear was real. It would be so because damaged food could simply mean long episodes of limiting or even famine. Unfortunately for the people back then, freezers, refrigerators, and other modern equipment we now get to enjoy were not unavailable then. Though the sunlight can be a practical way of drying food, it isn’t the best these days. The sun doesn’t always shine, in cold climates in particular. Moreover, when the sun shines even, the heat the sun rays provide is not consistent, and this is why you need a food dehydrator. The first food dehydrator was invented in France, in the year 1795. 0.1 What Can You Do With Your Food Dehydrator? What Can You Do With Your Food Dehydrator? It is safe to say that you are concerned that you will not have plenty use for the food dehydrator? Well, there are so many things you can do with a food dehydrator and below are some of them. The reasons listed above are sufficient for anyone to simply go ahead and purchase a food dehydrator. While food dehydrators aren’t intricate machines, they come in an extensive range of types and shapes and with a scope of features. 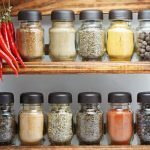 Below, we will review 10 of the best food dehydrators on the market and we hope you can choose one of them for your kitchen. 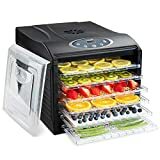 In recent years, Nesco has been one of the best manufacturers of food dehydrators, and with the Nesco FD-75A Snackmaster Pro, they have not harmed their already huge reputation. The company has produced several models of food dehydrators but the FD-75A stands out due to its incredible versatility and wide market appeal. 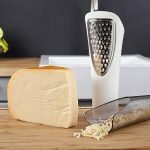 Both beginners and experts will find a lot of uses for this amazing machine. While this stacked model of food dehydrator comes with only 5 trays, there is an option for you to purchase more. The unit can handle as much as 12 trays comfortably for a large amount of dehydration. Besides, this machine will keep the UV rays out for the more efficient preservation of your vegetables and fruits. Furthermore, the machine features a handy thermostat whose temperature you can easily adjust. The internal temperature is regulated by the thermostat while a fan mounted at the top is incorporated to blow the air down over the food. However, the science behind the top-mounted fan is almost laughable as warm air rises. Thus it appears to be unreasonable to put the fan at the top. Lastly and probably most importantly, this machine comes at an affordable price. If you are just starting out at this, this is a cheap way to begin. If you use the machine well enough, you will make your money from the decreased wastage and the preserved food in the first couple of weeks. 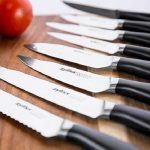 If despite everything you are still unsure about this entire food dehydration of a thing and not ready shell out much money on any of this machines, then the Presto 06300 is the ideal model for you. 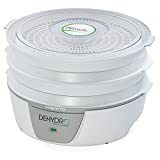 While an adjustable thermostat and a timer are missing in this dehydrator, it still provides a decent value for money. Instead of an adjustable thermostat, this model comes with a default temperature of around 155 degrees Fahrenheit. This means you must occasionally keep an eye on it and be very careful with leaving some foods in it for a long time. Despite this drawback, this dehydrator takes care of business, though not accurately. 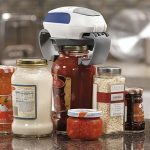 You can dry out vegetables, fruits, spices, jerky, and herbs with this machine. You will find 4 trays on the machine, of which you can expa4nd them up to 8. Besides, it features a bottom-mounted fan and a transparent cover which allows you to keep an eye on your food comfortably. 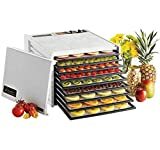 Another great thing about this excellent food dehydrator from Presto is that Presto has various expansion kits for people looking to add more trays and buy kits like jerky kits and non-stick mesh screens. If you are looking to purchase a food dehydrator, we advise you not to overlook quality as it is very important. Therefore, if you are looking for a food dehydrator that exudes quality, you should choose the Excalibur 3926TB food dehydrator as it is a top-quality machine powerful enough to handle everything thrown at it. Besides, we must not forget to mention that this machine is no model for beginners. It is a high-powered beast that is powerful enough to handle as much as 9 trays of food. It comes with a wide rear-mounted fan which does well in spreading even warm air across every shelf. Besides, this dehydrator can make home-made yogurt and accelerate the fermentation procedure, providing you with crisp food free of preservation in no time at all. Also, a rapid drying time ensures that not much nutrient is lost in the procedure, conserving the normal goodness of every food you dehydrate. However, if you are considering buying this unit, you should understand that it is quite large and will consume quiet much space on your countertops. This is a problem if you have a limited space, but if space isn’t your problem, all you need to do is dedicate a space for the machine so that it will not meddle with your everyday routine. The great Nesco FD-61WHC food dehydrator is in the same price range with the previous dehydrator from the same manufacturer, the Nesco FD-75A. Notwithstanding it isn’t as intense as the FD-75A dehydrator, the FD-61WHC comes with an all-inclusive kit alongside a jerky gun. Furthermore, this unit comes with a range of extra accessories and components such as a roll sheet for fruit and clean a screen for things such as herbs. In addition, a recipe guide comes with this unit, which will come very handy. All these accessories put together to make this product a great value for money. Additionally, this great unit comes with 5 trays alongside a top-mounted fan. While a top-mounted fan won’t likely blow the warm air evenly, it isn’t a bad addition. If we consider the general quality, this product is a very decent food dehydrator. It is built to perform exceptionally in most situations. And its ease of use is also a huge plus, especially for beginners. If you are looking for an incredibly long-lasting and powerful machine at an affordable price, you have just found it. 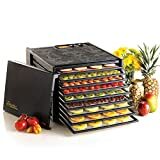 The Excalibur 3900B food dehydrator is a great machine that features 9 trays, which makes it perfect for people looking to dry out plenty food at the same time. Featuring incredible heating power and a 7-inch side mounted fan, this machine is sure to dry out your food evenly. Also, this model features Excalibur Hyperwave Fluctuation technology which makes hygienic dehydrating easier. While this model is somewhat too large for tight spaces, it is the ideal food dehydrator for heavy users and large families. This machine, with its 9 trays and 15 square ft of drying space, will be very helpful to large families and people looking to dehydrate in larger quantities. With that said, you will need to ensure you have enough space before purchasing this model. However, this machine is surprisingly lightweight despite its gigantic size, and that means you can easily transfer it from one place to another if there is a cause for it. If you are a beginner or a light user, the Waring Pro DHR30 is probably the ideal food dehydrator for you. With its incredible heating power, 5 trays, compact size, and its quiet operation, you can’t just go wrong with this model. 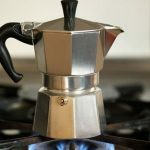 Besides, it comes with a feature that allows you to control its temperature, something that helps novices in becoming familiar with the overall temperatures needed for drying out various foods. Also, this unit comes with a very durable motor, which means it can withstand all sorts of use. Moreover, this unit features a fan at the top which helps spread the air over the 5 trays. However, the top-mounted fan doesn’t distribute the air evenly and you might need to be rotating the trays manually throughout the entire process. This issue usually comes with models with top-mounted fans and it is something you have to deal for a food dehydrator in this price range. Overall, the Waring Pro DHR30 performs better than some of its rivals when it comes to air distribution. The Hamilton Beach 32100A Food Dehydrator is generally considered to be one of the most outstanding affordable options. It comes with a timer and a temperature scope of 100 to 160, which will definitely impress buyers. In addition, the temperature settings can be switched to Celcius/ metric, depending on your personal preference. You will also find a tray for fruit rollups and mesh sheet in the package of this unit. The mesh sheet is used to dry herbs. This machine comes with 5 trays, and a very limited capacity, which means it isn’t ideal for heavy use and large families. 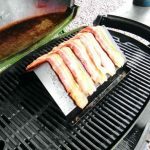 And with its vertical airflow, cleanup can be difficult at times, particularly when utilizing is as a jerky dehydrator. Users have complained about the necessity to change trays during the drying time and the uneven drying of this machine. 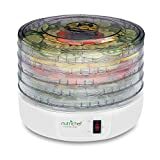 NutriChef Kitchen PKFD12 is another great affordable food dehydrator that is perfect for beginners and people who are just starting out in this. The first thing you will remark upon seeing this machine is how attractive it looks. While it is small in size, it seems cute and would enhance the overall beauty of your kitchen. You can stack the trays, which means you will without a doubt have the capacity to arrange them in the most appropriate way. It implies you should get used to the way everything in this machine works. The fact that the trays can be stacked means you can put heavier and bulkier meat types effortlessly. Furthermore, there are holes in the trays that essentially means there will be an easy and effective spread of airflow. The heat distribution will be affected by this and this will ultimately decide the level of the drying procedure. While their products are usually more ideal for customers on a tight budget, Nesco is a fairly famous company. The FD-61WHC is a very affordable food dehydrator with excellent functionalities and would make a great purchase for any beginner buying this kind of machine for the first time. At a time when manufacturers of food dehydrators seemed to have run out of ideas on how to improve these machines, come to Ivation, who have to breathe a new lease of life into the industry with the introduction of their remarkable Ivation Electric Countertop Food Dehydrator. This machine is one of the newest and best dehydrators you can find on the market right now. Obviously, usability is what Ivation had in mind when this machine was being made. 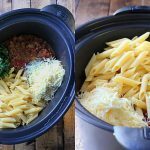 While other high-end dehydrators on the market seem too difficult to use and often leave users confused, this machine offers something totally opposite. 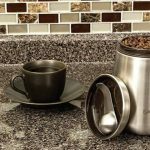 Ivation did their homework and found out what the consumers needed and how they needed it, and went ahead to manufacture one of the simplest and easiest to use food dehydrators you will ever see. Ivation’s Electric Countertop Food Dehydrator comes with a rear-mounted fan that is built to distribute air evenly without overheating. Besides, this unit comes with a thermostat that is adjustable and has an automatic shutoff which helps in ensuring foods are dried out to their maximum freshness and temperature. 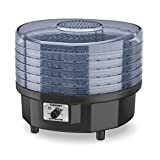 Our list would be incomplete without the amazing Excalibur 3926TB Food Dehydrator, which efficiently does everything required from a top-quality food dehydrator. 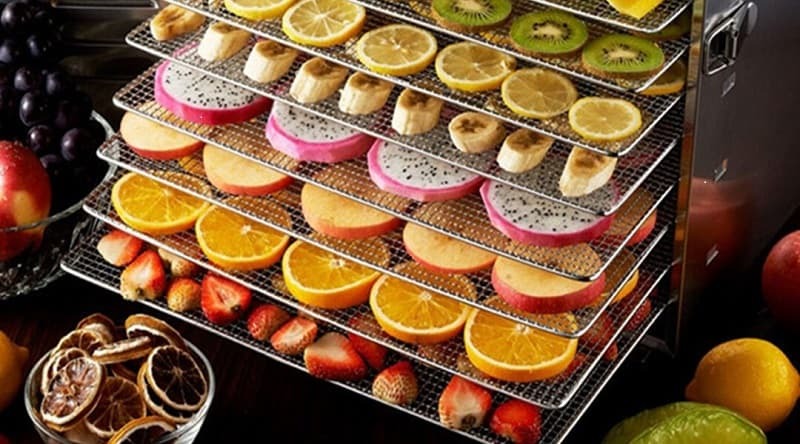 With its horizontal airflow and even air distribution, and 9 dehydrator trays, it is easy to see why many consumers are inclining towards this incredible machine. Although, this machine, due to its gigantic size, wouldn’t be ideal for someone with a tight place, but large families with large space would totally love it. While the fundamental functionality is always similar in every food dehydrator, there are varieties of features that make each food dehydrator different from the other. While the essential thing needed for a food dehydrator is to be able to dry food uniformly, additional features can be valuable as well. Is your countertop small and its space is limited? If yes, go for a model that is stackable due to the fact that these models come with the insignificant footprint. They rather have twelve to thirty racks that can be set on each other in order to vertically scale up as you need to increase your food. However, it is better to go through many reviews of shelf and box food dehydrators if you have a large space. In the end, regardless of the size of shelf and box model you go for, it is going to be a long-lasting investment of space in your kitchen. A stackable model, on the other hand, can lessen to a lunchbox size if you use it with only a couple of racks. Stackable dehydrators are known for their tendency to heat unevenly when the level of racks surpass 10-12. You may end up regularly swapping racks to prevent food over-drying. On the chance that you regularly have plenty food to dehydrate, it is advisable to opt for a more significant box and shelf model as they usually come with fans and dry every rack evenly. If there is a need for you to dehydrate plenty food at a time, you can always take out the racks, provided you are using a box and shelf model, and know that the food will dry out evenly. This is impossible in stackable dehydrators since their racks fit onto each other closely. Then again, if you expect a spike in the measure of the food you are expecting to dehydrate, a stackable model, with its better versatility, is perfect. Regardless of the features of the food dehydrator, these products generally are either made of metal or plastic. If a food dehydrator is made of plastic, it should have FDA certification. It must have been tested to make sure that no plastic vapor emanates from it when at high temperatures. Likewise, metals ought to be one of the acceptable food-grade materials acknowledged by the FDA. Despite the quality however, in the event that you expect to use dehydrators for long stretches, the quality of plastic has a tendency of degrading rapidly when likened to metal, which makes latter an excellent choice in such situations. If you often travel by train or car, you can choose to carry your food dehydrator with you. In such conditions, stackable dehydrators can prove to be perfect companions as they have little initial size. Also, these models are lightweight and don’t give you unnecessary issues at metal detector doors. On the other hand, metal dehydrators are heavier and can be prevented from being carried in places where the carrying of huge metal substances in passenger aircraft is prohibited. As will soon be revealed by the reviews below, stacked models usually cost below $75. However, you can purchase box and shelf food dehydrators if you are ready to part with about $200-350. Therefore, if you are on a budget, it is advisable to opt for the less expensive option, which is the stacked dehydrator. If you are confused about what a food dehydrator does, just take a look at its name. Fundamentally, this machine removes water from various food items. As a result of the drying procedure, preserving food for the longer period is then made possible. By using a fan and heat source to create an improved airflow, a food dehydrator is capable of doing extraordinary things for you. If you are bent on carrying out food preservation, using an excellent food dehydrator is the best way to go about it. For cereals, snacks, casseroles, sandwiches, or soups, your diet will be improved by eating dehydrated food. Food dehydration will enable you to save money, and enjoy natural and healthy food whenever you want it.